Nickname(s): "बिग एपल", "गोथाम", "द सेन्तर अफ द युनिभर्स", "द सिति द्यात नेभर स्लिप्स", "द क्यापितल अफ द वर्ल्द"
↑ "Why is New York City known as "the Big Apple" and "Gotham?"". Dictionary.com, LLC. Retrieved 2011-06-16. ↑ "Showcase Destinations New York City: Capital of the World". Mpiweb.org. September 22, 1924. Retrieved 2011-06-16. ↑ "About New York City". The City of New York. Retrieved 2011-06-16. ↑ Eugene J. Sherman. "FORWARD New York – Capital of the Modern World". The Weissman Center for International Business Baruch College/CUNY 2011. Retrieved 2011-06-16. ↑ the Mayor, New York City Office of (January 8, 2010). "Biography". New York, City of. Retrieved 2010-01-08. ↑ "Annual Estimates of the Resident Population for Incorporated Places Over 50,000, Ranked by July 1, 2011 Population: April 1, 2010 to July 1, 2011". U.S. Census Bureau. Retrieved 2013-02-17. ↑ Blake Ellis (March 25, 2011). "America's 5 biggest cities". © 2013 Cable News Network. A Time Warner Company. All Rights Reserved. Retrieved 2013-02-17. ↑ "World's Largest Urban Areas [Ranked by Urban Area Population"]. Rhett Butler. 2003–2006. Retrieved 2011-04-26. ↑ "Largest Cities of the World – (by metro population)". Woolwine-Moen Group d/b/a Graphic Maps. Retrieved 2011-04-26. ↑ "Largest Urban Areas in the World: 2008 All Urban Areas 2,000,000 & Over". Wendell Cox Consultancy. Retrieved 2011-04-26. ↑ "All Municipality Websites Listed Alphabetically". 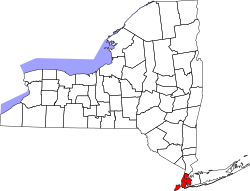 New York State. Retrieved 2011-09-18. ↑ "GLOBAL POWER CITY INDEX 2009". © 2009 The Mori Memorial Foundation. All rights reserved. Retrieved 2012-06-01. ↑ "Office of the Mayor Commission for the United Nations, Consular Corps and Protocol". The City of New York. 2012. Retrieved 2012-02-05. ↑ "Consulate General of Iceland New York Culture". Consulate General of Iceland New York. Retrieved 2013-02-17. ↑ "Consulate of Latvia in New York". Consulate of Latvia. Retrieved 2013-02-17. ↑ "Introduction to Chapter 14: New York City (NYC) Culture". Copyright © The Weissman Center for International Business Baruch College/CUNY 2011. Retrieved 2013-02-17. ↑ "New York, Culture Capital of the World, 1940–1965 / edited by Leonard Wallock ; essays by Dore Ashton ... [et al."]. NATIONAL LIBRARY OF AUSTRALIA. Retrieved 2013-02-17. This page was last edited on १९ मे २०१४, at ००:२४.